Young women around the world are coming closer to Jesus Christ through camp. 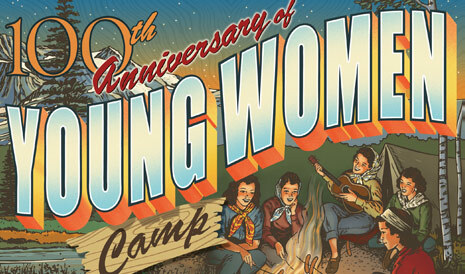 This year we will celebrate a century of Young Women camp. Young Women camp was developed as a response to a need for summer work for the young women of the Young Ladies’ Mutual Improvement Association (the name of the Young Women organization at the time). Since 1912, many Young Women camps have been established and dedicated all around the world. A camp with the most basic and simple accommodations can become a sacred place where the Spirit of the Lord is present, where daughters of God put the principles of the gospel into practice, and the glorious blessings of nature are appreciated in happy ways. All over the world, young women like yourselves are enjoying the experience of camping. In Africa, one of the first camps was held at a chapel where the young women slept on the grass and learned to cook on an electric stove. In other places, camp is held on the beach or in the jungle or in the mountains. Wherever camp is held, one thing is sure: young women love to go to camp! When asked about the favorite part of the Young Women experience in general, the majority of young women I have visited with say, “Camp!” Why is this a favorite? What happens at camp that makes this such a memorable experience? Camp has always been a favorite activity because it is at camp that you can establish a mini home. Your tent becomes your home, and there you can gather all the essentials you need to be happy and comfortable and progressing. At camp you can discover that the Lord is great. He has provided this beautiful earth for us to enjoy and preserve. At camp, you learn that you really don’t need much to be happy. You leave your makeup and music behind and learn to become self-sufficient. You learn the importance of a strong, healthy body so you can climb mountains and swim in the ocean or in streams. You learn that the scriptures can speak to you very personally, and you also experience what it feels like to be still and to listen to the song of a bird or to the voice of the Spirit, sometimes for the first time. Read the Book of Mormon and share your testimony of what you learned and felt in a special campfire meeting held during camp. Record 100 blessings you have received or felt while at camp. Perform 100 acts of service while at camp or in preparation to go to camp. Research 100 names to take to the temple in preparation for camp. Shine 100 lights from a high place at camp to represent your desire to stand for truth and righteousness and let the light of the Savior shine in your lives. Share 100 scriptures with the other young women at camp. Think of 100 ways you can bless your family when you return from camp. Compose a special song to celebrate camp in your area. Perform a skit showing what you think the first camp may have been like. Look in the scriptures for people who camped, and share their experiences. You will think of more things you can do to celebrate this wonderful gift of Young Women camp. As you prepare to go to camp this year, may you always remember that each part of the Young Women experience is to help you grow in your faith and testimony of the Savior, understand your true identity as a daughter of God, and help you feel and recognize the Spirit’s guidance in your life. As you participate in this wonderful opportunity and leave the world for a few short days to camp with your friends and your leaders in Young Women, we know you will learn and do things that will help you be prepared for the grand future that is yours, and you will desire to always be worthy to be in the temples and receive the blessings that are waiting for you. Have fun! And remember you are one of God’s most precious creations! In 1912, the Liberty Stake of Salt Lake City, Utah, planned and carried out the first recorded summer camp. The young ladies attended weekly meetings to plan, execute, and report their camp experiences. They engaged in fund-raising activities, including a campfire entertainment to advertise their project. The camp fee was 65 cents per girl! The young ladies tried out nutritious, well-balanced, easy-to-prepare menus in preparation for camp. To get to the camp, the young ladies traveled south of Salt Lake City by streetcar to a location that is now in the town of Murray, Utah. Here they loaded their bags and bedding onto a wagon and then hiked a little over a mile to the banks of the Big Cottonwood Creek. The stream was widened and deepened in one place to allow for wading and swimming. During the week, young ladies were taught about flowers, insects, birds, and plants. They cooked and ate in the open. They concluded the week with a hayrack ride and a night to entertain parents and ward friends who visited the camp. During the summer of 1912, 82 young women and 15 officers attended the camp. See several more articles celebrating the 100th anniversary of Young Women camp at lds.org/go/YWcamp.